Today I received my contributor’s copy of this very substantial book (to which I’ve contributed the final chapter). It’s edited by Louise Ravelli, Brian Paltridge and Sue Starfield, who all teach in Australia (Louise and Sue at the University of New South Wales and Brian at the University of Sidney) and is published by Libri Publishing. 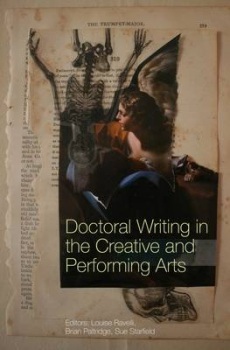 The editorial team previously worked together on a research project that focused on doctoral writing in the creative and performing arts in Australia, and wanted to produce a book that focused on “the diversity of written forms” to be found in theses. Louise is an expert in matters of academic literacy, Sue has already published extensively on issues related to doctoral writing and supervision, and Brian is, among other things, an editor emeritus for the journal English for Specific Purposes. As this might suggest, this is a book intended to offer useful practical insights to both students and supervisors alike. One of it’s aims is ‘to ensure that current knowledge in the field” of creative and performing arts research “is widely disseminated” and I very much hope that it does so, since the editors have worked long and hard to pull it together. I particularly respond to the way in which they have included the student voice, so that the second of the three sections consists of contributions from seven former doctoral students. My own essay is in part a ‘pair’ to one published earlier this year in the second edition of James Elkins’ Artists with PhDs: On the New Doctoral Degree in Studio Art (which as yet appears to be unavailable in this country). This entry was posted in News on November 21, 2014 by Iain. On Wednesday 12th a panel consisting of Barbara Hawkins, Brett Wilson, Stuart Sim and myself, launched the Art, Science, and Cultural Understanding book at a well-attended event held GV Art in London http://www.gvart.co.uk This is the result of a long dialogue between members of Project Dialogue, one of a number of independent trans-disciplinary academic and creative networks supported by PLaCE International http://placeinternational.org/dialogue.htm In addition to the four of us – the three book editors and myself – we were joined by some other contributors to the book, namely Bronwyn Platten, Shelley James, Robert Devcic (the GV Arts gallery’s founder and curator), Susan Aldworth and Karen Ingham. Most of them contributed to what turned out to be a fairly lively dialogue with an interesting and mixed audience. Some aspects of the discussion confirmed the editorial teams’ view that: “one of the core issues addressed by radical work in both the arts and science is that of maintaining a meaningful polyvocality in the face of monolithic notions of ‘truth’ or ‘reality’, particularly given the contemporary reduction of all competing rationalities to that of the market” [p. xxiii]. Others, however, confirmed that many established artists and scientists are all too happy to accept that reduction if it allows them to maintain their involvement in lucrative and prestigious posts and practices. In short, those with institutional power and cultural authority as artistic or scientific researchers tend to remain firmly wedded to the possessive individualism that underpins the dominant scientific and cultural realpolitik. This is, of course, as unsurprising as it is depressing. Much more positive was the real sense that those on the institutional ‘margins’ – retired educators, part-time teacher/artists, doctoral students, etc. – have a rather clearer sense of the ethical obligations involved in trying to maintain that “meaningful polyvocality”. One result of this is that it’s hard to avoid the sense that those most vociferous in promoting ‘Science Art’ are those who have made a name for themselves doing it and are, in consequence, the most anxious to see that it continues to be uncritically promoted and, of course, generously funded. Again this tends to confirm the editors’ view that: “The current vogue towards an inherent mono-culture fed by ‘best practice'” – namely the practices authorised by those with the greatest institutional power and authority – “in which it is conveniently forgotten that, without prior diversity there can never be such a thing as best practice at any any given moment …” [p. xxiv]. If nothing else, the evening confided for me Barbara and Brett’s observation that “our universities” – and very often by implication those whose Art Science practices they both promote and underwrite – “are ‘mal-adapted’ for adjustment” to the new eco-social situation in which we find ourselves and that “our current degree and diploma structures are designed for a world that ‘no longer exists’. (Malina 2013, 5) [p. 66]. In this context it is interesting to note that Robert Devcic was himself very critical of much of the work produced under this rhombic and has deliberately avoided specifically linking the gallery to it. This entry was posted in News on November 16, 2014 by Iain.